Actually is the second time that I bought this model because I love it. I picked a smaller size (.5) because they can stretch. It was tight and the style didn't work for me. It was cut too high across my instep for me to be comfortable, but I have one foot prone to swell, so that might work better for someone else. It was a diappointment for me. Look nice and they are very comfortable. These shoes help my feet so much at work. I can tell a huge difference since I've been wearing them. I love this shoe! It was recommended to me by lots of students in my nursing program and I've heard nothing but good things about them from current nurses! It's comfortable and actually has a pretty good style! These shoes are very nice and comfortable . Can't wait to wear these in the kitchen. These shoes are sooo comfortable! As a therapist in a rehab and nursing facility, I am on my feet most of the day and with these my feet aren't sore at the end of the day. I will definitely be buying another pair!!!!! These shoes are sooooo comfortable!!! As a therapist in a rehab and nursing facility I am on my feet most of the day and at the end of the day my feet aren't sore at all! I will definitely be buying another pair! I LOVE these shoes! I have had several compliments and tgey are very stylish and match everything. They hug my feet and are very durable. So sad I did not purchase these sooner. I LOVE these shoes! I have had several compliments and they are very stylish and match everything. They hug my feet and are very durable. So sad I did not purchase these sooner. very comfortable runs slightly small after I put my inserts in. I am exchanging the 8W for an 8M. The right foot was significantly wider than the left. My roommate even agreed when trying them on her feet. The left one was good, but since they are leather and will stretch, I'm hoping the 8M will still fit okay on the left. Great otherwise though. Very glad to be wearing these to work soon. I love these shoes..the look and the fit. This is my second pair of nursemates. Shoeline was so easy to use too. I just hope they keep putting out new colors and designs in the Libby shoe. Everytime i order from shoeline they are fast,exactly what i order i think everyone should order from here. They are great. Great fit, very comfortable. Love the printable size chart. Bought these for my daughter for work and it took a while for her to break them in, but now she says they're comfortable. I don't know what the issue was, but for the price they should have fit like a glove. A very comfortable shoe. Light weight, feels good on my feet. I bought this for Christmas gift for my kin and she loves it!! Her coworkers compliments her all the time...I bought another pair for me and after then my legs never hurt! I always recommend it to my go worker how it feels good to my feet and how my feet and legs never hurt anymore after a long shift at work. I like the feel of these shoe however I needed a half size bigger to be comfortable. Looking forward to getting through a 12 hour shift. In general I really like these shoes. I would probably rate them with 4 or even 5 stars if there was more cushion under the ball of the foot. These shoes are otherwise wonderful. They are attractive and the price is about right for what I expect to pay. Shoes fitting is uneven; right shoe is way wide and my feet keep sliding forward. Probably got the 'display shoe'. Sending them back ASAP!!! These shoes are WONDERFUL for my feet that have had many surgeries. Good support and fit. They are light weight and wear forever. This is a shoe that can be worn all day without any problems. The Libby style is a classic for dress up or a pair of jeans. I plan to order more in the different colors. Thanks shoeline for offering this great shoe! Beautiful shoes with great flexibility. Thought they were my best shoe dream come true.Heel is not as high as described, and I needed some height for bone issues. Ordered 2 pair in different colors. One pair has a left toe area that is shallow so rubs the top of left toe, and one pair has right toe that is shallow so rubs top of right toe. This problem might be corrected if shoe was true to size. I typically wear 9 1/2 so ordered 10, but feel the 10 should be 10 1/2. One pair also has a top interior heel pad seam that is not trimmed tight enough so the extra seam leather rubs my heel while trying to get to patients quickly. Sadly I will have to return both pairs of shoes. I love the fact that we have choices in colors now beside the white or black. 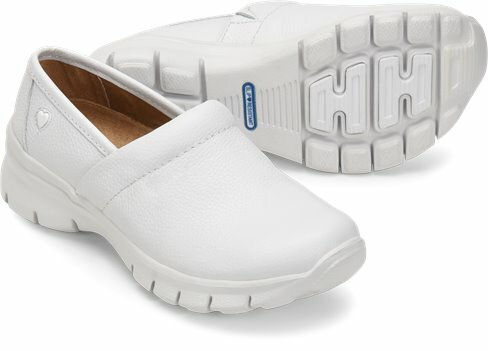 I have the white as well.You can wear them with style and comfort, I will be ordering some in other colors soon. Everything about this style is perfect. The fit is accurate,.Shoeline is the place to shop where they carry a full line of sizes and colors. Love this shoe! They are very durable (without being hard or stiff) and supportive with the firm but yet cushy insoles, no aching feet or back pain with these! They are also very stylish, not clunky like many work shoes. The only thing I would like for myself would be maybe just a little bit more arch support (I do have a bunion and have to be really careful about my work shoes) but they are still very comfortable. And expect to receive these from Shoeline in about 2 to 3 days with their quick shipping! I highly recommend these great shoes! Stylish for a nursing shoe. Comfortable.